It's good to take stock from time to time but at forty or fifty-something you can find that you're dissatisfied and bored. The temptation is to take a wrecking ball to your life but that risks alienating your partner and your children – without necessarily ending up any happier. Just gritting your teeth, doesn't work either – anyway, you've already tried that! Fortunately, there's another way to become fulfilled and lead the life that's right for you (rather than what your parents, society or anybody else thinks). The three central questions you need to answer (and why everybody else is distracting themselves and avoiding facing them). How to put what's happening now into the context of your whole life journey. How to avoid the tempting short-cuts that cause more heartache in the long term. Why if you pass this midlife test everything is up from here. Why you're not in the wrong. A whole new vocabulary for discussing the midlife crisis without putting your partner's back up. What's really going on in your partner's head. What causes depression and how to help. Five killer replies to the blocks that stops you talking properly about your marriage. Together you will learn three new skills that will either change your marriage into the connected, fulfilling and loving relationship of which you've always dreamed or help you separate amicably and be great coparents together. Is your relationship in crisis or rapidly heading that way? Does it feel like you and your partner have stopped listening to each other and you're either walking on eggshells or exploding with anger? Have you reached the point that you see things so differently you wonder whether it's even worth trying to explain your feelings? If that doesn't sound bad enough, there's something about being forty- or fifty-something that makes the situation even worse. First of all, the stakes are higher at this stage in your life than at any other. You may have young or adolescent children and you don't want them caught in the crossfire—so you bite your lip and soldier on. Second, your parents are getting old and statistically either you or your partner is likely to have lost one of them. You might even be actively caring for a parent. This is a stark reminder that you are not immortal and, therefore, time is running out. Third, our society is terrified of aging and goes to great lengths to deny it's happening. For example, I appeared on a radio phone-in recently where the host proclaimed that fifty was the new thirty. So not only is there no road map ahead for the forty- or fifty-somethings among us, but the few signposts that exist are controversial and likely to get you and your partner at each other's throats. I am talking, of course, about the so-called midlife crisis—the logical explanation if your partner has turned into a stranger (and a highly critical one at that), but if you're the one who is questioning your life (and feeling dissatisfied) the term midlife crisis will probably put your back up or make you feel blamed. Whichever side of the debate you stand, I have a radical idea: it's not a midlife crisis, it's an opportunity (by which I mean a chance to learn, grow, and transform your life for the better). I am writing this book from personal and professional experience. I'm fifty-seven and the past twenty years have been, by a long distance, the toughest. However, despite coping with my mother's dementia, my father's frailty, and yesterday catching sight of what at first appeared to be an old man's body in the changing-room mirror of a clothes store, I can honestly say that I have never felt more content, fulfilled, or excited about the future. In each chapter, I will cover a different aspect of being middle-aged—like career issues, depression, affairs, and aging—to explain what is really going on; share relevant scientific research and current psychological and philosophical ideas on the topic; introduce exercises to help you cope better; and teach you new skills to move forward. The book is divided into three sections. The first is written for ­people questioning their life, their relationship, and everything. The second is for their partners who are coping with the fallout. Which­ever side you're on, please read both parts as this will help you understand your partner better and that's an important ingredient for breaking the deadlock. In part three, there is advice about negotiating a way through any differences between you and your partner. I will also introduce three key concepts which will either change your marriage into the connected, fulfilling, and loving relationship of which you've always dreamed or allow you to separate amicably and be great co-parents together. ©2017 Andrew G. Marshall. All rights reserved. 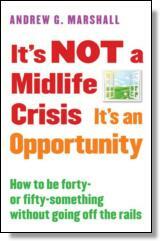 Reprinted from It's NOT a Midlife Crisis It's an Opportunity: How to be Forty-or Fifty-Something without Going Off the Rails. No part of this publication may be reproduced, stored in a retrieval system or transmitted in any form or by any means, without the written permission of the publisher. Publisher: Health Communications, Inc., 3201 SW 15th Street, Deerfield Beach, FL 33442. Andrew G Marshall is a marital therapist and author of the international best-sellers I Love You But I'm Not in Love with You and How Can I Ever Trust You Again? and seventeen other titles. His books have been translated into twenty different languages. He trained with RELATE—The UK's leading couple counseling charity—and leads a team in London offering the Marshall Method and intensive therapy in Berlin, Germany.